This is how a perceptive Lebanese Christian writer, Antoine Bara, characterized the stand of Imam Hussainb. Ali (a), the Third Imam in the line of succession to Prophet Muhammad (s), against the tyrant ruler Yazid b. Muawiya, the ruler of the Umayyad dynasty. He included “all” religions because they, and most especially the divine religions of Judaism, Christianity and Islam, share some universal principles and values. 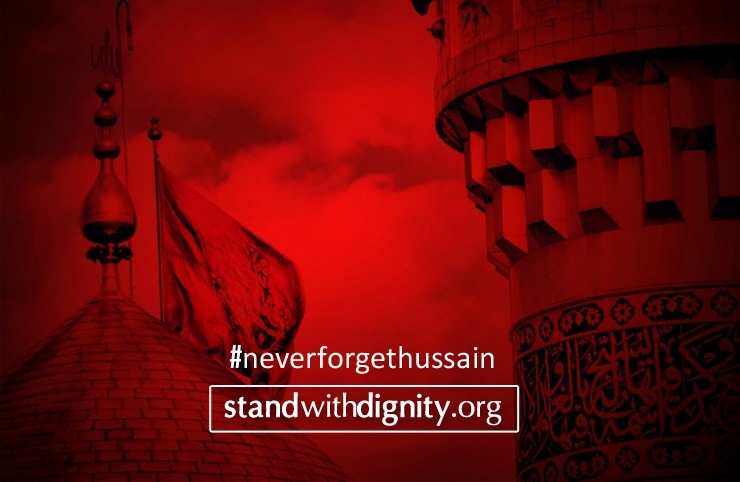 He made Imam Hussain the “conscience” because (a) these principles and values were never so flagrantly violated as when the Umayyads became the rulers of the Muslim dominions, and (b) no single person in history had ever challenged thesetransgressions as determinedly as Imam Hussain did. Bara, therefore, deemed it fitting to designate the Imam as “the conscience of all religions” for his principled fight against the downwardly spiraling atrocities of falsehood, corruption, injustice and oppression that began in earnest duringthe second half of Uthman b. Affan’s reign,a caliph from the Umayyad clan, around the middle of the seventh century, within two decades of Prophet Muhammad’s demise. Except for a short interval of some five years following Uthman’s murder when Imam Ali b. Abi Talib (a) assumed leadership and sought to right the wrongs, the situation further deteriorated under the Umayyad dynasty that was established in 661 CE and, specifically, during the Imamat ofHussain, when Muawiya b. Abi Sufyan and his son Yazid were the rulers. The above verse is in the context of Jewish scholars who knew of the advent of the Holy Prophet from their scripture, Taurah(Old Testament), but perverted its verses in order to hide the truth from the people. This was an abominable act because they distorted the word of Allah (swt). However, the verseisof general application as are all the teachings of the Qur’an. Allah warns against any attempts to confound the truth with falsehood. Furthermore, if any person, whether it is a scholar or a ruler, knows the truth,they are duty bound to make it manifest. Falsehood is, in fact, the “mother of all sins” as it is the fountain head of all manner of sins. The Umayyad set up vicious propaganda machinery designed to safeguard their dynasty. This is best illustrated by an incident that occurred during Muawiya’s rule. On the return from the Battle of Siffin, an Iraqi came to Damascus in Syria mounted on a camel. A Syrian alleged that the “she-camel” was his and had been looted in that battle. The dispute was brought to Muawiya for resolution. The Syrian produced fifty witnesses who deposed that the she-camel belonged to him. On the strength of that testimony, Muawiya ruled in favor of the Syrian. The Iraqi protested that it was a he-camel, not a she-camel. Muawiya, however, did not rescind his decision but, instead, when the court had emptied out, he asked the Iraqi the value of the camel and compensated him with more than its value. He used the incident to pass on a message: “Tell [Imam] Ali that to fight against him I have 100,000 men who do not distinguish between a he-camel and a she-camel;” the point of the message was that if Muawiya says that a he-camel is a she-camel, or vice versa, no one would dare contest his statement. 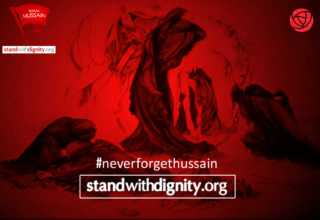 The propaganda campaign was ratcheted after the assassination of Imam Hussain. Yazid wished to deflect any criticism of his regime for this action. The disinformation circulated was, first, that the anonymous persons killed in Karbala in Iraq were “garden variety” rebels who did not enjoy any status in the community. Second, the rebels sought to challenge the legitimate authority of the state. Thus, when the members of the Prophet’s family were paraded in the courts of the governor of Kufa (in Iraq) and the court of Yazid in Damascus (in Syria), the people turned out to denounce them and pelt them with stones. It was Imam Zainul Abidin (a), the Imam’s son and successor, and Sayyida Zainab (a), the Imam’s sister, who in their khutbasor sermonsin these courts acquainted the audience that they were direct descendants of Prophet Muhammad and the Umayyad regime’s actions were contrary to the teachings of Islam. It was then that the public realized that the regime had blatantly lied to them. The surrounding verses distinguish between those who show sincerityand those who showhypocrisy in their faith. The above verse states that if a latter person gets to be in a position of power, he creates mischief in the land. Fasad literally means corruption, decay, immorality or mischief. Corruption has such a corrosive effect on the society as a whole that it was a concern that the angels raised with Allah when He informed them that He was planning to put a khalifaor a caliph [Prophet Adam] on earth. One dimension of corruption is nepotism. Uthman summarily dismissed the governors of the provinces when he came to powerwithout providing any grounds for their dismissal. He replaced them with others solely because they were his close relatives and/or members of his Umayyad clan. Thus, he appointed his step-brother (Walid b. Aqaba) as the governor of Kufa, his cousin (Abdullah b. Aamir) as the governor of Basra (another town in Iraq), his foster-brother (Abdullah b. Saad) as the governor of Egypt, and confirmed an Umayyad (Muawiya b. Sufyan) as the governor of Syria. The manifest impiety of most of these nominees and the fact that their familieswere the bitterest opponents of the Prophet offended religious Muslims of Hijaz, the western region of the Arabian Peninsula. Furthermore, their gross misconduct in their gubernatorial positionsresulted in delegations being dispatched from the provinces to Medina, but Uthman failed to address their grievances which culminated inhis murder. Another dimension of corruption is misappropriation of funds of bait ul-mal(the public treasury) which wereto be held as a trust for the Muslims.Nothing could be received except through lawful means, and nothing could be dispensed except for lawful purposes. Uthman owned large properties in different cities and, when he died, he left behind 150,000 gold dinars, one million dirhams, a large number of horses and camels, and many slaves and slave-girls. By contrast, when Imam Ali was martyred, Imam Hasan (a), his successor,announced that his father had not left behind any gold or silver and 700 dirhams that he had saved from his salary werefor the purpose of procuring a servant for his wife.Besides enriching themselves, the Umayyad rulers made huge gifts of money from the public treasury to their kith and kin. The “powers behind Uthman’s throne” were handsomely rewarded; Hakam b. Abul Aaas (his uncle) was allowed to keep 300,000 dirhams that he had collected as a poor tax and Marwan b. al-Hakam (his cousin and son-in-law) was given all the booty from a military campaign estimated to be half a million pieces of gold. He gave two other son-in-laws (Harith b. al-Hakam and Abdullah b. Khalid) a total of 900,000 dirhams as wedding gifts. These examples representbut a small sample of the largess that was bestowed upon the Umayyads, a practice that was continued by Muawiya. The greatest act of injustice that was perpetrated by the Umayyad rulers was to dishonor the treaty whereby Imam Hasan abdicated khilafat or caliphatein favor of Muawiya. One of the most important terms of the treaty was that Muawiya would not appoint a successor after him. 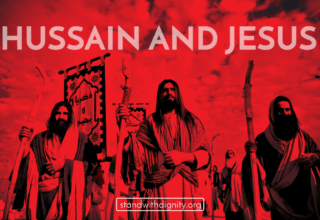 However, after he arranged for the death of Imam Hasan by having him poisoned, he actively campaigned for Yazid to be the next, hereditary ruler of the Muslim dominions. However, this was not a campaign that was waged on the merit of the appointee or the free expression of the people. Muawiya intimidated and/or bribed key officials to secure their consent to his plan for succession. 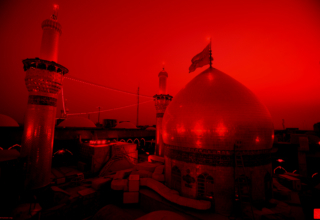 There were only a handful of holdouts from among the companions of the Prophet, the most prominent being Imam Hussain. Despite alternatively using persuasion and threat, Muawiya did not succeed to obtain their oath of allegiance. He had warned Yazid to tread gingerly with Imam Hussainin particular,but Yazid chose to forcibly extract the pledge which the Imam defiantly refused to make. The Qur’an declares that perpetrators of aggressionwill be held to account and that severe punishment awaits them in the hereafter even ifvictims of that aggression are able to seek retribution in this life. Allah absolutely abhors tyranny of any kind. 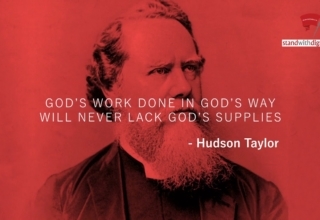 But He reserves the most severe judgment for the worst form of tyranny, namely, murder of innocent persons. The Qur’an uses a simile to make the point: “… whoever kills a soul without [being guilty of] manslaughter or corruption on the earth,it is as though he had killed all mankind, and whoever saves a life, it is as though he had saved all mankind.” (5:32) It may seem odd that the murder or rescue of one individual is said to be equivalent to the murder or rescue,respectively, of all of humankind. The implicationisthat the act is respectively so heinous or virtuous that the security of all is at risk or the well-being of all is assured. There was no safety or security of life or property especially of the devotees of the Ahlul Bayt, the prophet’s infallible progeny. Thousands of them were killed and thousands more migrated to places outside the jurisdiction of the Umayyad rule. The most prominent companions of the Prophet some of whom he personally certified as having attained higher levels of piety were not spared. Abu-Dharr al-Ghifari, an outspoken critic of misappropriation of booty and funds, was recalled from Syria to Medina by Uthman; when he didn’t cease his criticism, he was exiled to an out-of-the way place where he died in abject condition. Ammar b. Yasir, also a conscientious objector, was twice mistreated, once when he objected to Uthman helping himself to a piece of jewelry from the treasury and, again, when he presented him with a letter of advice from the companions; on both occasions, Uthman beat him until he lost consciousness. Muawiya went a step further. He ordered preachers in all the provinces to curse Imam Ali in their sermons from the pulpits. It appears that one reason for this injunction was to “smoke out” Imam’spartisans so that they could be terrorized and/or eliminated. Mitham at-Tammar, upon refusing to curse Imam Ali, had his limbs severed and his body nailed to the trunk of a tree; when he persisted in praising the Imam, his tongue was cut off. Hujr b. Adi al-Kindi and his associates objected to the cursing and were also against the rule of Muawiya and they were dispatched from Kufa to Damascus with an indictment that included trumped up charges of rebellion against the regime and disbelief in God; Muawiya gave Hujr and six of his associates a chance to win their freedom if they would denounce Imam Ali but they refused and were consequently beheaded. The moral and criminal transgressions described in this essay were a direct consequence of the deviations that had occurred in Islamic ideology and in the implementation of its basic tenets following the demise of the Prophet. The early rulers professed Islam even while their actions were designed to bend the religion to legitimize their regime and its policies. Yazid made no such pretense and he went so far as to declare that “It was all a game of Banu Hashim [the Prophet’s clan]; neither was there any revelation nor any news [of the Unseen].” He thus denied the existence of Allah and the prophethood of Muhammad and engaged in the most immoral and unethical behavior that does not become a Muslim, let alone a ruler of the Muslim ummahor community. 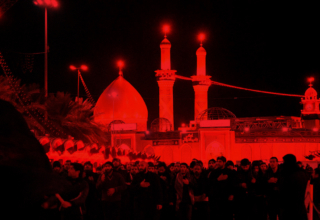 When the conscious pricks sharply, as did Imam Hussain’s, it is a call for decisive action. Yazid’s installation happened to bean opportune time for the Imam to launch his revolution to ensure that the distorted version of Islam practiced by officialdom does not bury the pristine version taught by Prophet Muhammad.